Flexibility is the inspiration behind the Ford Freestyle. Bridging the gap between sport utility vehicle and sedan, this innovative crossover utility vehicle is ideal for active families and their evolving lifestyles, combining real-world utility with impressive fuel economy and comfort. For 2007, Freestyle customers can choose among four new packages for added comfort and convenience features. Two new exterior colors are also available. Later in the model year, seat-mounted side air bags and the Safety Canopy side air curtain system will be standard on all models. Crossover utility vehicles are gaining popularity with buyers because they provide space, packaging flexibility, available all-wheel drive (AWD) and sedan-like fuel economy. Even in this highly capable and competitive segment, Freestyle sets an impressive benchmark for comfort, versatility, efficiency and safety. It can carry up to seven adult passengers with its best-in-class legroom in the second and third rows. Freestyle is also capable of achieving up to 27 miles per gallon highway. Its versatile fold-flat, third-row seating provides flexible cargo-carrying capacity. As a result of these admirable attributes, Freestyle appeals to families that have grown too large for a sedan but who do not want a traditional minivan. It also appeals to sport utility customers who seek efficiency without giving up functionality. Freestyle offers two levels of comfort and luxury: SEL and the top-of-the-line Limited. Freestyle is built in Chicago. Freestyle is designed to stand apart with its long hood, high belt line, large wheels and tires, aggressive “grille guard”-style lower fascia, flared wheel arches, large side mirrors and hefty strap-style door handles. SEL models have an electronic message center, leather-wrapped steering wheel and shift knob and a sound system with six-disc CD changer. The top-of-the-line Limited series includes a monochromatic exterior, heated exterior mirrors and interior amenities such as an Audiophile sound system, perforated leather seating surfaces, and heated seats for driver and passenger. Freestyle’s instrument panel gives the driver and passenger the look, feel and attitude of a sport utility, complete with a robust grab handle mounted on the passenger side. The contrasting center stack contains all climate and audio controls and is topped with two round air registers. The flow-through center console houses the floor shifter, two ample cup holders and a roomy center storage console. The second row of the Freestyle is a comfortable place to be for long trips, with standard reclining bucket seats or a 60/40 split-fold bench for seven-passenger capability. When bucket seats are selected, second-row seats on Limited models are mounted on optional adjustable tracks to increase legroom. The standard third row is uncharacteristically comfortable, thanks to an innovative package design that includes a raised roofline and a well-packaged independent rear suspension below the floor. Clever storage solutions abound. A recessed lid atop the instrument panel hides a convenient storage bin. A standard overhead console in the front row provides room for sunglasses and garage door openers and includes a convex “conversation mirror,” a popular feature borrowed from Ford’s minivan family that lets the driver direct an eye toward rear-seat passengers. The first-row console features a power point, handy for recharging portable devices such as mobile phones or laptop computers. A small cutout prevents the charger cord from getting pinched when the console lid is closed. Freestyle offers four packages for the 2007 model year. SEL models offer an Interior Convenience Group that includes AM/FM with an MP3-capable, six-disc, in-dash CD player; automatic headlamps; dual electronic automatic temperature control; fog lamps; and outside-temperature display. An Interior Power Package also is available on SEL models, which includes an eight-way power driver seat, adjustable pedals and a four-way power passenger seat. In addition to the standard side-impact air bags and three-row Safety Canopy side air curtain with rollover detection coming later in the model year, the SEL Safety and Security Package includes, an anti-theft perimeter alarm, perimeter lighting and heated exterior mirrors. An available Limited Convenience Group features memory adjustable power pedals, Reverse Sensing System™, a universal garage door opener and a rear cargo net. Freestyle’s power comes from Ford’s proven Duratec 30 3.0-liter, V-6 engine, matched to a continuously variable transmission (CVT). The combination of stiff chassis, high-torque V-6 and wide-ratio transmission adds up to surprising performance and drivability for a vehicle that can haul passengers or cargo in any weather. Freestyle’s CVT offers advantages not found in traditional automatic transmissions. It uses two variable-size pulleys — one for input from the engine, the other for output to the drive wheels — connected by a steel link belt. It varies the effective sizes of the two pulleys to meet the driving demands of the moment. Electronic powertrain controls, including a sensor on the electronic throttle, constantly monitor the demand for power. When more torque is needed for acceleration or to maintain speed up a steep hill, the transmission seamlessly responds by creating the right drive ratio from an infinite number of possibilities, allowing the Duratec 30 engine to operate at optimum performance. The Duratec 30 doesn’t require a tune-up in its first 100,000 miles. Freestyle offers an optional all-wheel-drive system. This application uses an electronically controlled, electrohydraulic, limited-slip coupling positioned just ahead of the rear differential to transfer available torque to the rear wheels whenever the front wheels slip. Electronic controls that gather information from the antilock braking system and other sensors allow the all-wheel-drive system to react within 50 milliseconds — much faster and more seamlessly than systems that rely on viscous couplings. Traction control is standard on vehicles equipped with all-wheel drive. When all-wheel drive isn’t needed, Freestyle functions as a front-wheel-drive vehicle. 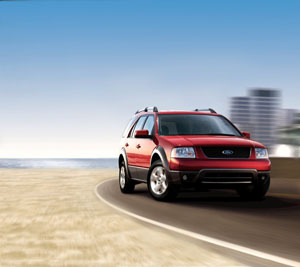 In addition to earning top marks in front- and side-crash tests, the 2007 Freestyle is equipped with standard seat-mounted side air bags and Ford’s innovative Safety Canopy air curtain system (late availability). The Safety Canopy uses rollover detection, an industry-exclusive safety feature that offers head protection for all three rows of outboard occupants in side impacts and rollovers. The Freestyle is a top performer in its category in the government’s rollover stability test as well. Freestyle’s side-impact protection raises the industry bar by using laser-welding techniques for side pillars that help redirect crash forces underneath the vehicle’s seats. This energy is further channeled through a cross-car tube. Ford also breaks new safety ground with Freestyle’s adaptive steering column, which collapses horizontally at two speeds, based on the driver position. Air bag deployment is tailored to the position of the driver’s seat on the seat track. SEL includes: 17-inch, five-spoke bright aluminum wheels; automatic headlamps; chrome grille surround; heated exterior mirrors; fog lamps; body-color door handles and mirrors; AM/FM audio system with six-disc, in-dash CD changer; leather-wrapped shift knob and steering wheel with remote audio controls; message center with electronic compass and exterior perimeter lighting; seat-mounted side air bags and three-row Safety Canopy side air curtain with rollover detection (late availability). Limited adds: 18-inch bright aluminum wheels; body-color cladding and mirrors; perforated leather seating surfaces; eight-way power driver’s seat with memory; four-way power front-passenger seat; heated front seats; second-row floor console (six-passenger only); second-row fore-aft seat adjustment (six-passenger only); 50/50 split third-row bench seat; Audiophile audio system with six-disc CD changer and subwoofer; cargo net; dual-zone climate control and wood-grain interior appliqués. Options include: Interior convenience group; interior power package; SEL safety and security package; Limited convenience group; SIRIUS satellite radio; adjustable pedals with memory; all-wheel drive with traction control; navigation system; DVD family entertainment system with two wireless headphones; moonroof; seven-passenger seating with 60/40 second-row bench; auxiliary climate control and Reverse Sensing System.